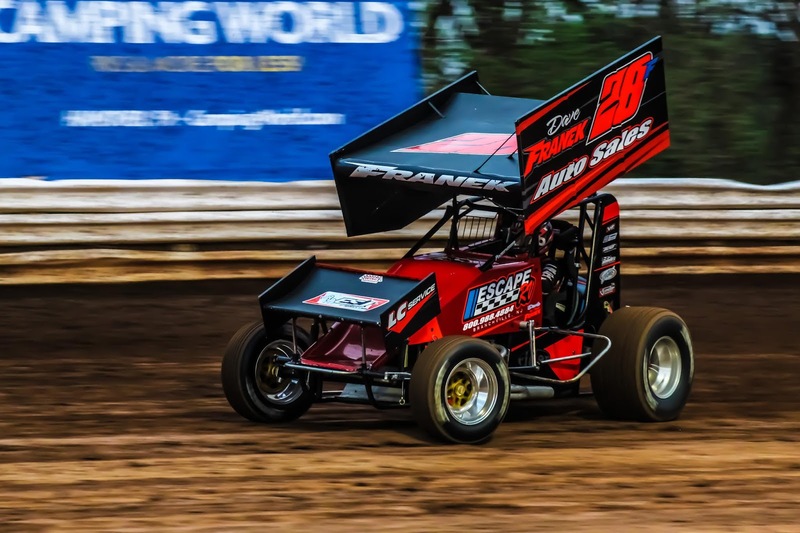 SELINSGROVE, Pa. -- Davie Franek of Wantage, N.J., inherited the lead on lap nine in the 30-lap Jack Gunn Memorial for 360 sprint cars Saturday night at Selinsgrove Speedway when race leader Mark Smith of Sunbury made contact with a disabled lapped car in turn four. Bryan Bernheisel of Lebanon and Gene Knaub of York raced side-by-side during the final five laps of the 25-lap super late model race with Bernheisel edging out Knaub by just .69 of a second for his second win of the season at the track. Tommy Slanker of York got back to Victory Lane in the 15-lap pro stock feature after battling some early season mechanical woes. Ryan Zook has become the driver to beat this season in the roadrunner division when the Mifflintown young gun won his third race of the year. Selinsgrove Speedway will present the Kramer Cup for 360 sprint cars at 7 p.m. Saturday, June 2, on Reinhart Food Service Night. The 30-lap tribute race honoring the memory of former track champion Kramer Williamson will pay $2,573 to win and $300 to start. The limited late models will compete in two 20-lap features, one of them being a makeup race from May 5. The pro stocks and roadrunners will round out the four division racing card. Pit gates will open at 4 p.m. with grandstand gates at 5 p.m.
Mark Smith pulled into the lead from his front row starting spot in the sprint car main event. Second-place starter Chad Layton challenged Smith for the lead for the first two laps until Smith settled into the front spot. Fourth-place starter Davie Franek then caught Layton in a battle for second. On the eighth circuit, misfortune struck Smith when he made contact with a disabled car in turn four. Franek inherited the lead at this point only to have the race stopped on the subsequent restart when Michael Walter crashed hard in the same spot as Smith. Walter escaped injury from the wild flip. When the race resumed, Franek and Layton see-sawed for the lead as sixth-place starter Jason Shultz entered the picture. At the halfway point, Franek started to navigate his way through lapped traffic. In the final laps, an intense battle for the lead and win unfolded as Franek was being reeled in by Layton. The caution flag unfurled on lap 25 for Colby Womer’s stopped racer in turn two. On the restart, Shultz and ninth-place starter Derek Locke drove by Layton for second and third, respectively. At the finish, Franek took the checkered flag by .95 of a second over Shultz, Locke, Eric Tomacek, and Layton. Polesitter Bryan Bernheisel drove into the lead at the start of the super late model feature. Second-place starter Brett Schadel and fourth-place starter Gene Knaub dueled for the runner-up position on the first lap with Knaub taking the spot. On the second circuit, sixth-place starter Jim Bernheisel got by Schadel for the third position. By the 10th circuit, B. Bernheisel encountered slower traffic as Knaub remained in striking distance. At the halfway point, B. Bernheisel and Knaub were locked in a wheel-to-wheel battle for the lead. On lap 20, Knaub slipped by B. Bernheisel and held the lead for four laps with Bernheisel racing in his shadow. B. Bernheisel made the winning pass back by Knaub with an inside move in turns one and two on the white flag lap. At the checkered flag, B. Bernheisel was victorious by .69 of a second over Knaub, eighth-place starter Jim Yoder, 17th-place starter Kenny Trevitz, and third-place starter Randy Christine. Front row starter Tommy Slanker pulled into the lead at the start of the pro stock feature and was chased by fourth-place starter Shaun Lawton for 13 laps. Brad Mitch, who started 13th, advanced to third on lap 10 and got by Lawton for second with two laps to race. Mitch made a last-ditch effort to catch Slanker for the lead and win but came up just .55 of a second short at the finish. Lawton settled for third followed by Kyle Bachman and Brandon Moser in the top five. Following a restart after a three-car tangle in turn four, fifth-place starter Ryan Zook stormed into the lead in the roadrunner feature. Third-place starter Smith Cope kept Zook in his sights for all 12 laps with fourth-place starter Keith Bissinger in contention in the third spot. Zook held off Cope by the slimmest of margins at the checkered flag for the win. Bissinger, Will Brunson, and Bob Bussey, who was involved in the first lap incident, rounded out the top five.